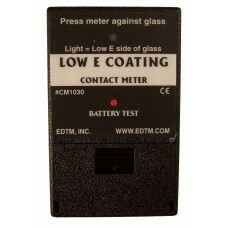 The CM1030 detects any conductive surface, including Low-E coatings on single sheets of glass. 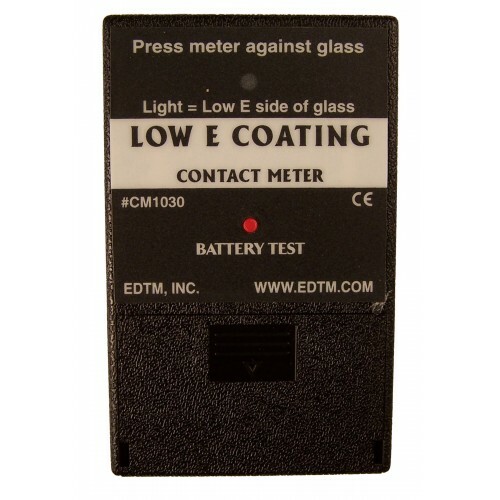 Simply press the meter against a piece of glass to determine whether the surface you are touching contains any conductive (Low-E) coatings. The tester uses four (4) non-scratch pads on it's back side that prevent damage to coatings and provide a fast, easy test - ideal for the manufacturing environment. Please Note: The CM1030 works on single panes of glass only by directly contacting the test surface. Since Low-E Coatings are oriented on the inner pane of IG units, the CM1030 is not suitable for use on manufactured IG's. Please see the Etekt + if you need to test manufactured windows. The CM1030 has a unique design that allows you to test hard coat (pyrolytic) or soft coat (sputter) Low-E coatings. Because of the ultra-sensitive design, the meter is even capable of detecting most coatings that are protected by a thin protective dielectric coating. The CM1030 is specifically designed for the manufacturing environment. Due to the meter's simplicity, production personnel will need minimal training to understand the meter's indication. The CM1030 is great for identifying the orientation of Low-E glass as it is being placed into the washers or assembled into insulating glass assemblies. Suitable for single panes of glass only. Please see the Etekt + if your testing application is anything other than single panes of glass. The AE3600 Single Pane Low-E Coating Detector Detect Low-E Coatings on Single Pane Glass: The AE3600 Single Pane Low-E Detector checks both surfaces of single pane glass with one test from a single side. The AE3600 is optimized for testin..
ETEKT + Low-E Detector The ETEKT + has been serving an important role for glaziers worldwide for nearly 25 years: locate invisible Low-E coatings on IG units with a definitive, non-destructive test. With the release of the AE1601 (second generation ..